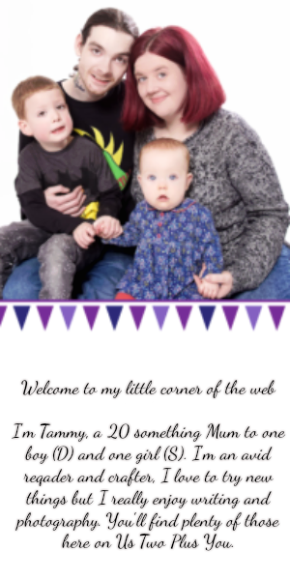 Over the last few months bed time has got harder and harder with D. We've been trying everything we can think of including longer stories, cuddle time, extra time to calm down before bed and baths as much as we could manage before bed. Nothing was helping! He would go to bed fine but would still be up hours later unless we walked for miles! 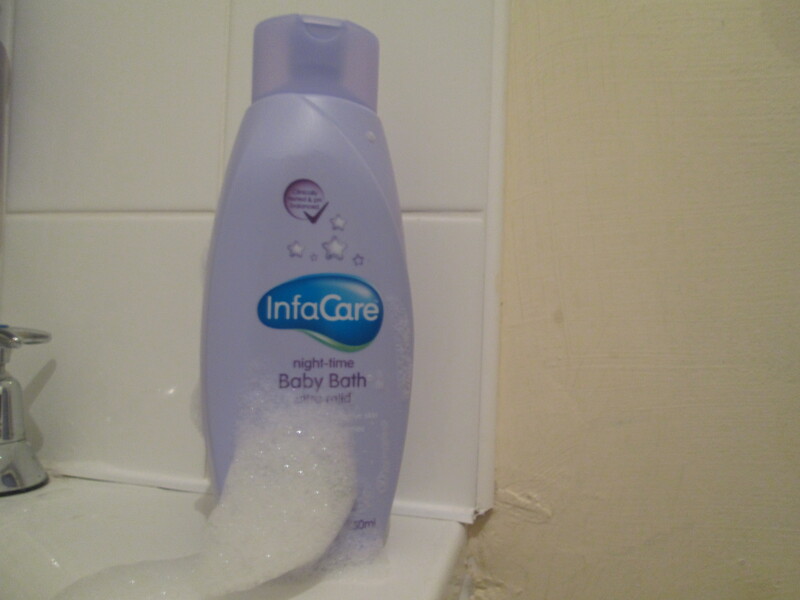 I was contacted about trying out Infacare's night-time Baby Bath a couple of weeks ago. Of course I had to say yes! I was ready to try anything that might work to help him get to sleep, talk about perfect timing! If you have never heard of Infacare is a baby bath product which is ultra mild. Both of Infacare's products are PH Balanced, meaning that they create naturally occurring acid and alkaline levels which are usually found on the skin or in the hair. 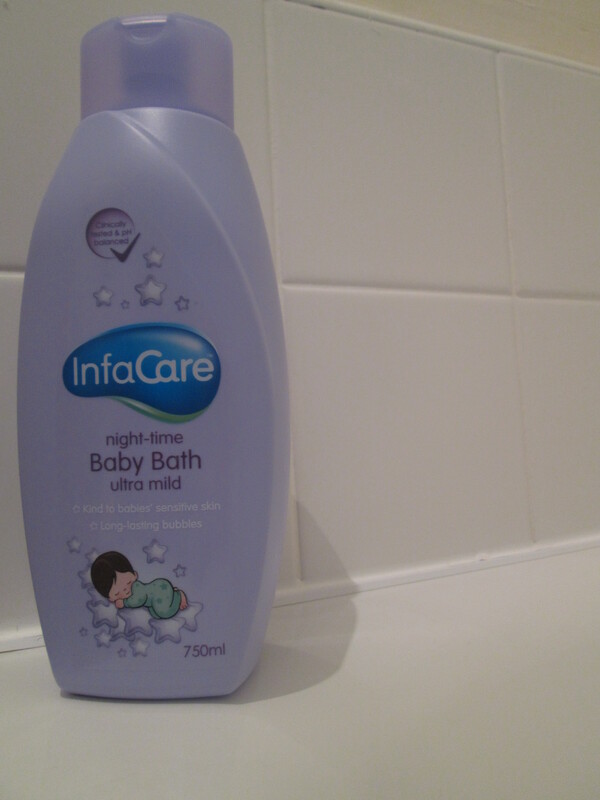 As you can see above Infacare's night-time Baby Bath comes in a rather large bottle, 750ml to be precise. Although the bottle is very large, it wasn't something that I felt impacted the use. Since it is a bubble bath which I usually add in with the water once it has started to heat up. I did find that the lid isn't too hard to open. For us this meant D could open it himself with a little effort. I think a lid which would require the bottle be squeezed would make it harder for children to use and ensure water wouldn't get in quickly either. It wouldn't affect use either since it is added to the bath while you are running the water. Infacare's night-time Baby Bath has a beautiful scent which is hard to describe. The smell seems to make me think of flowers that might bloom in the middle of the night! It smells oriental in origin with hints of other subtle flowery based scents added in, although it is very subtle! Making it hard to really pin point each scent alone. I must say I love the scent itself! I look forward to running the bath for the children and allowing the scent to fill the room. The first time I added Infacare's night-time Baby Bath under running water, I added the amount I usually would with other bubble bath products. Much more than is recommended on the bottle (probably about double). 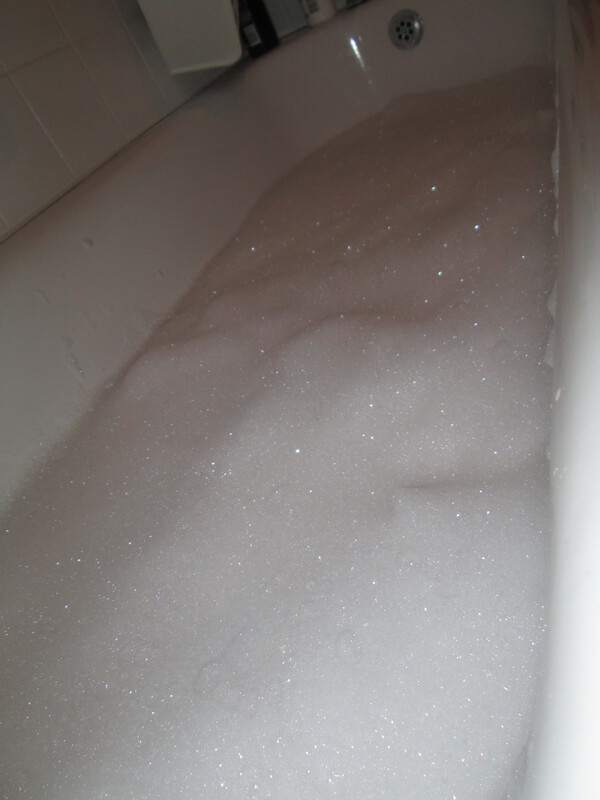 However I was not expecting the amount of bubbles! 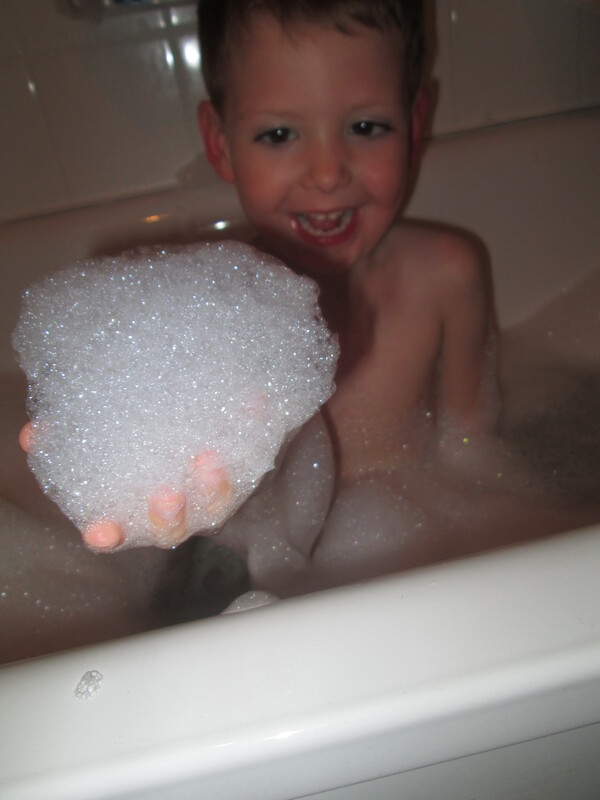 There ended being as much bubbles as there was water! I have never found a bubble bath that bubbles up so well. I actually had to stand for a few minute scooping up mounds of bubbles and filling up the bathroom sink so the D and Baby S could safely get in the bath. D loved playing with the bubbles and as you can see above. He has a great time playing every bath time now. 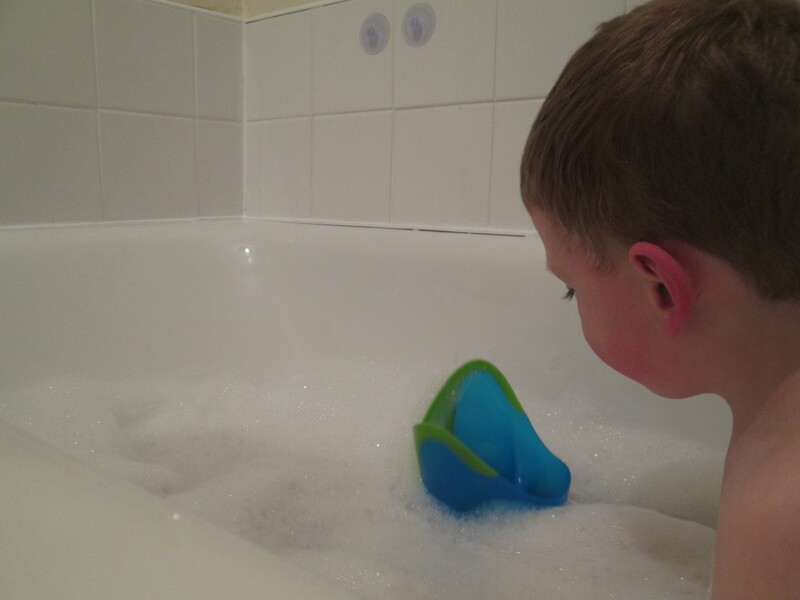 They also hold together really well, meaning playing with the bubbles lasts for much longer. D was delighted! The bubbles usually last longer than his bath now days. I'm not sure I really went into this thinking that Infacare's night-time Baby Bath would really work. However D has fallen asleep within 30 minutes every time we have used it! In fact Simon and I have been talking about making baths a daily event since he sleeps so much better when he uses Infacare's night-time Baby Bath in the bath! Baby S had really sensitive skin in the first 2 or 3 months and has only now started using bath products. Her first being Infacare's night-time Baby Bath and although she doesn't sleep through on the occasions when she has joined D in his bath with Infacare's night-time Baby Bath she has had an hour or two just after her bath. If you're struggling with bed times or you want to add something to your children's bedtime bath routine which will help them relax and get ready for sleeping then Infacare's night-time Baby Bath is the product for you! It is perfect for families at bed time. You can purchase Infacare's night-time Baby Bath is available in 750ml (RRP £3.79) click on the link to purchase from ASDA online. You will also find it in major high street stores including , Boots, Co-op, Lloyds Pharmacy, Sainsbury's, Tesco and Wilkinson. Disclaimer: We received the featured product in return for an open and honest review. All thoughts and opinions expressed above are my own.